ST. ALBANS — When Marjorie Weeman’s husband died 25 years ago, amid the grieving, she found an unexpected silver lining. “The funny part of it is, when he was alive, I never had a chance to enjoy the outside,” Weeman, now 78, said last week, watching through a large window as a strong, wet wind shook a tree in her front yard. For healthy postmenopausal women who do not have osteoporosis, the International Osteoporosis Foundation recommends using a combination of diet and exercise to maintain bone health. Exercises should include weightbearing exercises, such as dancing, high-impact aerobics, hiking, jogging or running, jumping rope, stair-climbing and tennis. They should also include muscle-strengthening exercises, such as lifting weights, using elastic exercise bands, using weight machines, lifting your own body weight, and standing and rising on your toes. Diets should include calcium-rich foods, such as milk, yogurt, kale, sesame seeds, rice pudding, pasta, figs and tofu. Weeman, one of millions of women who suffer from osteoporosis, underwent an innovative spinal surgery in an effort to correct a painful back injury she suffered earlier this year. During their marriage, while the couple raised three sons together, Weeman’s husband, a carpenter, tended to the landscaping and lawn mowing, while her domain was the inside of the long, single-story house. When her husband died in a car accident in 1988, in addition to dish washing, ironing clothes, and vacuuming, Weeman took up raking, home repair, and clearing branches off the property. As she aged, from her early fifties and into her sixties, Weeman expanded her outdoor activities. She joined some of her 12 brothers and sisters as they went blueberry picking each summer, and began playing outside with her grandchildren. But as she aged, Weeman also developed osteoporosis, a common disease among older women, whose bones begin to lose density and strength after menopause. Because osteoporosis leads to bone fractures in one in three women, health advocates call it the disease that shatters women’s lives. Weeman, who continued to work and play outdoors as she grew older, didn’t know it, but her life was about to be shattered. Every spring, she said, on the road that runs past her house, snowbanks melt, leaving a large amount of sand from the plow trucks on her lawn. One of the duties she inherited from her husband was raking the sand up into piles and then shoveling it into a wheelbarrow. 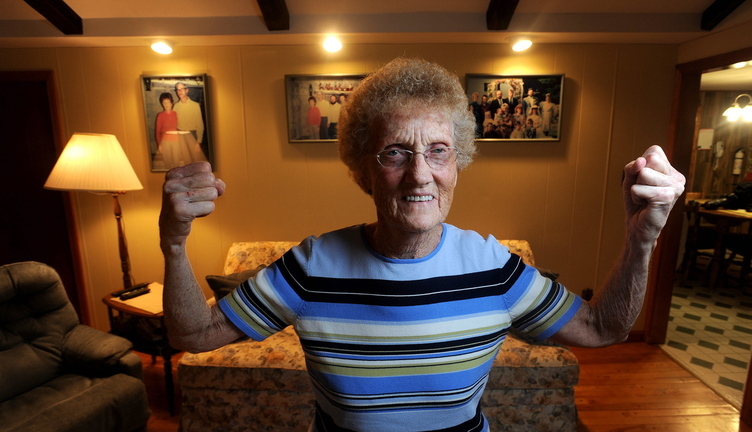 “When you live long, you have to do what you have to do,” she said. In April, after an hour of arduous shoveling in a treacherous morass of slush and mud, Weeman’s back broke. 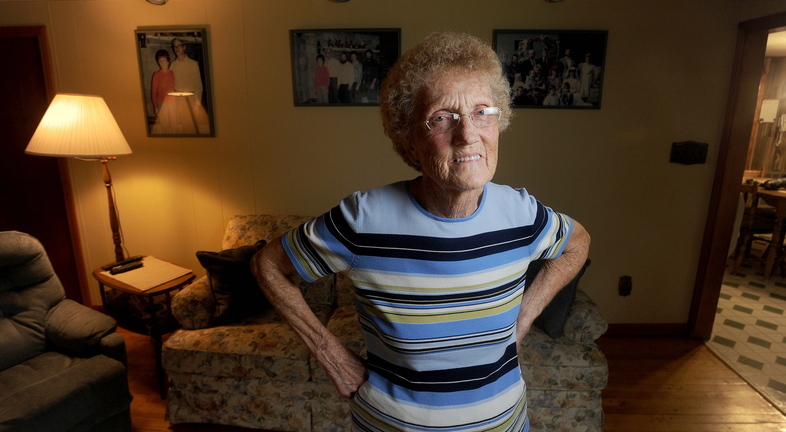 She didn’t realize it was broken, but it was — a spinal fracture, the kind that afflicts 700,000 Americans, mostly older women suffering from osteoporosis, each year. When a vertebra is fractured, the torso is less likely to be held upright in the future, which places additional stress on other vertebrae and increases the likelihood of more fractures. All Weeman knew was that she was experiencing about the worst pain of her life, including childbirth. Weeman left the wheelbarrow where it stood and headed for her front door, worried her love affair with the outdoors might be at an end. “I dropped the shovel right there and almost crawled to the house. I could hardly stand to get in here,” she said. If Weeman injured her back 10 years ago, doctors may not have been able to help her, Dr. Ben Zolper, of Northeast Pain Management in Bangor, said. “Nobody had an effective treatment for this problem,” Zolper said. He said there was a theoretical fix to the problem involving a support structure of metal plates screwed into the spine, but it was so impractical he’s never seen it done. That meant that, often, the only treatment was to try to alleviate the pain with drugs, an idea that neither Zolper nor his patient like as a long-term solution. “I’m not a pill-popper,” Weeman said. She was stoic about the pain, and shed no tears over it, she said. After trying to tough out the pain for two weeks, Weeman’s siblings convinced her to visit the family doctor, who referred her to Zolper. He first tried, unsuccessfully, to treat the pain with a muscle relaxant. “It didn’t even touch it,” she said. But Zolper wasn’t done. Six years ago, he became one of the first doctors in Maine to begin performing a new procedure, called balloon kyphoplasty, or just kyphoplasty. During the procedure, doctors insert pillow-shaped balloons, and then bone cement, into the fractured vertebra, which hardens into a kind of internal cast that allows the bone to heal in its natural position and provides ongoing support. Zolper said that, in July, an X-ray and an MRI of Weeman showed a compression fracture on her lower spine, right where such injuries are most common. Spinal injuries are more serious than other injuries, Zolper said, because the only way to relieve pressure on the spine is by lying down, which can turn an otherwise healthy and active person into a sedentary one. A person whose movement is restricted can lose the health and emotional benefits of exercise, creating a downward spiral that accelerates physical deterioration and increases the risk of depression, he said. Doctors often say surgical procedures should be a last resort, particularly on older patients, because of the risk of complications. Weeman, who endured the crippling pain for months, felt like she didn’t have any other choice. She had given up many of her chores and missed her annual blueberry picking outing. To accept the pain for the long term, she said, would have limited her too much — she would have to give up her chores, her independence, and much of the outdoors. For her, that would have been like giving up living. And so, at about 7:30 one August morning, Zolper and a licensed staff sedated Weeman in his office, and began to cut into the skin of her back, performing a surgery that has its own story. Kyphoplasty, the equipment for which was first sold by a company named Kyphon in 1999, is still meeting resistance from some medical professionals. The stakes over whether it is best medical practice are high and growing. As America ages, more people are fracturing their spines, costing an estimated $13.8 billion to treat in the U.S. in 2001 and an estimated $17 billion in 2005. A recent market research report found the global market for spine surgery devices, such as those used in kyphoplasty, is currently more than $11 billion annually and will reach nearly $15 billion by 2017. The number of kyphoplasties performed increased nearly every year since 2001, topping out at more than 87,000 today, according to MLS Group, a corporate communications company for Kyphon, which was purchased in 2009 by a medical device corporation called Medtronic, for $3.9 billion. Since researchers began trying to measure the effects of kyphoplasties in 1999, most have found it to be safe and effective, but two studies published in the New England Journal of Medicine in 2009 and 2011, found it was no better than a placebo at reducing back pain. Influenced in part by that study, the American Association of Orthopaedic Surgeons has been slow to embrace the use of surgery to correct back pain. In 2010, it specifically recommended against using vertebroplasty, an earlier form of the procedure that used bone cement, but no balloon, and offered only a limited recommendation on kyphoplasty as an option for certain patients. On the other hand, numerous other studies published in a variety of medical journals have documented the advantages of kyphoplasty, and the procedure has gained growing acceptance in the medical community. In 2006, Medicare published a reimbursement code for kyphoplasty, a major validation of the procedure that has been renewed during annual reviews, most recently in May. A 2009 joint statement by the American Society of Spine Radiology and various other professional associations found kyphoplasty to be safe, effective, durable and cost effective, with the potential to immediately improve the quality of life of its patients. Most recently, in October, a study by researchers at Johns Hopkins was published that analyzed data from 69,000 Medicare patients that found patients who underwent kyphoplasty had shorter hospital stays, fewer complications, and lived longer than those whose spinal compression fractures were treated with other methods. Each medical research study has its limitations, and it can be difficult for a doctor to weigh them and their conflicting conclusions. Zolper said that, after having performed hundreds of the procedures, he is more than confident that he is helping those in pain. “I think this is an area where I’ve been able to make a significant impact for the good,” he said. Another issue is that, by the time the research is strong enough to support universal agreement on a procedure’s value, new advances already threaten to render the procedure obsolete. Just last week, the Pain Physician Journal published a study measuring the impact of the Kiva VCF Treatment System, another spinal fracture surgical treatment which loops a plastic coil into the vertebra before the bone cement is piped in. According to the study, Kiva is more effective at easing pain and preventing future fractures than kyphoplasty. When Weeman drove with her sister to undergo the kyphoplasty in August, she had no knowledge of any debate in the medical community over the surgery’s effectiveness. She trusted her provider, Zolper, who told her that there would be no pain during the hour-long procedure. “I never felt a thing, not even a needle prick,” she said. And when she woke up, for the first time in months, the pain in her back was gone. “All I can say, it took care of that awful pain that I had, so I can’t see but that it did do good,” she said. Life for Weeman has improved. She’s back to where she was before the weight of a shovelful of sand cracked her vertebra. On weekdays, she waits for the children to get out of school — not her children, or her grandchildren, as she did in decades past, but her great-grandchildren. It was working in the yard that led Weeman to love being outside, but that doesn’t mean she loves all of her yard work. As long as Weeman’s back holds out, she holds herself responsible for the raking, a burdensome task this time of year that qualifies as outdoor time she doesn’t necessarily enjoy. Watching the wind outside her home, she sighed.